One of the most important bits of advice we can give you about hardwood floor refinishing is that the floor will never look like a brand-new floor. With age, the hardwood itself ages. Not every ding or scratch will be removed. But the good news is, that your refinished hardwood floor will look more beautiful than ever before because of this. Just as wine is better after time, so are hardwood floors. The timeless look of an old hardwood floor is elegant, comforting, and beautiful. If the floor isn't that old, of course you'll have a newer look when the hardwood is refinished. Looking at your old hardwood floor, you may wonder if it can be refinished or if it's better to replace it. And, you may wonder about the process. The experts at 1st Quality Floors, an Atlanta flooring company, offer the following questions and answers to help you learn about hardwood floor refinishing. What's Involved In Hardwood Floor Refinishing? If you're wondering what to expect during hardwood floor refinishing, a lot will depend on the unique condition of your floor. If there are dents, stains, chips, gouges, or missing pieces, they must be repaired first. This, of course, means the process may be more involved and take a little longer. Your floor refinishing process may be as simple as roughing the surface and reapplying the finish or it may need to be completely restored. To put it simply, hardwood floor refinishing will commonly involve repairs, careful sanding to keep the beautiful grain pattern of the wood, possibly reapplication of stain, and new sealant applied. This depends on the quality of the hardwood floor, how it's been treated previously, and how the owner feels about how it looks while it's aging. How Many Times Can Hardwood Floor Refinishing Be Done? If refinishing wasn't properly done in the past, there may be fewer times left to refinish. Also, if the hardwood floor is not solid wood but has a thin upper layer, it can't be refinished as often. In general, a quality hardwood floor can be refinished about six times. You may be wondering if your hardwood floor can be refinished or if it has to be replaced. This depends on what type of flooring material is used, how many times it's been refinished, and the condition of the hardwood. It's best to hire a professional to know for sure because it takes skill and knowledge to know which is best. For instance, you don't want to find out you actually have laminate flooring and try to refinish it as you would solid hardwood floors. 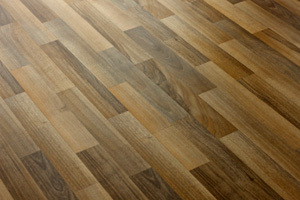 If the hardwood floor has been taken care of, it can last upward of 50 years. The good news is that most, 95%, hardwood floors can be refinished rather than replaced. If you have questions or need Hardwood Floor Refinishing in Atlanta, please call 678-615-7799 or complete our online request form.